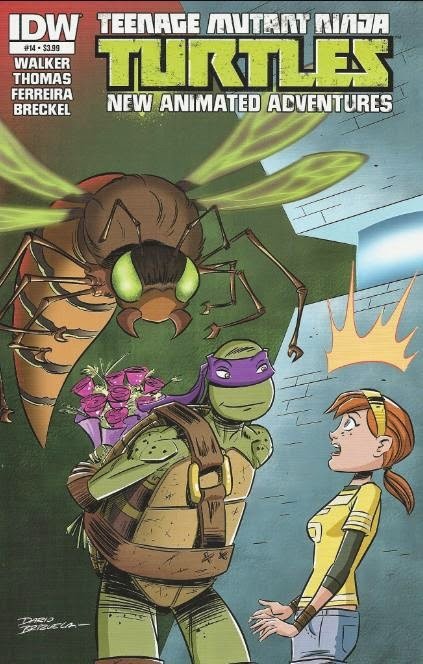 *This issue is continued from TMNT New Animated Adventures #13. The series continues in TMNT New Animated Adventures #15. *This issue was originally published with 3 variant covers: Regular Cover by Brizuela, Cover RI by Paulina Ganucheau, and Subscription Cover by Jennifer Meyer. I find these so boring. It's go from Point A to Point B, throw in a line from the show, add something that's played for laughs but isn't funny, with HORRIBLE colors. The End. What's with the coloring? It's unappealing, and ugly. The art's dull, also.